LIVING DEAD GIRL will be released January 17th 2014. Yay! A little scary and exciting at the same time. It feels like this project has been in the works for so long. I'm also super psyched to show off the gorgeous cover. What do you think? 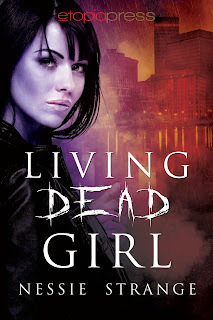 LIVING DEAD GIRL is the story of Jen MacLellan, a straight-laced twenty-one-year-old who finds love in an unlikely place: in the arms of crass, outspoken punk rocker Jack Norris. Their passionate relationship ends tragically with Jen's death, and as a ghost, she's heartbroken as she watches Jack's life unravel. Caught between the need to save her lover from a tragic fate and the desire to exact revenge on the woman who stole her life, Jen convinces the reaper to bring her back so she can set things right. It never occurs to her that she could be putting Jack in more danger...as well as risking her own passage to the afterlife. Yay! Congrats! And look at that cover! I can't wait to read it and see the final version! YAY!!!!! I was hoping I'd get to see the cover soon :D It's gorgeous!!! And I can't wait to buy a copy soon!!!!!!!!!!! Wow, I'd buy it just for the cover. Who did that? Congrats, Nessie. I'm not sure who did the cover--Etopia has a few different artists--but I love how it came out.